Ten and Chiaki made up a story about the two of them dating to fend off Riku's brother Rei, but Chiaki's having major second thoughts – namely, he thinks that Ten and Riku should be a couple, not he and Ten. Even though he's developing feelings for the girl, he's determined to get Ten and Riku together. Meanwhile Riku's not sure if he can, or wants to, overcome his feelings for his housemate, but he'd like to do what's best for her. And where does Ten stand in between these two boys thinking of her without actually asking her what her feelings are? One of the most enjoyable aspects of suu Morishita's Shortcake Cake is that its romance doesn't rely on rivalries or underhanded tricks. In fact, at this point it even lacks the female rival who is so central to many romances, shoujo or otherwise. Instead the story focuses on the emotions of the three central people involved, Ten, Chiaki, and Riku, to the exclusion of almost all other players in their lives. In the previous volume Riku's brother Rei appeared, and while he did gum up the works of Riku and Ten's potential romance, he was hardly the only factor interfering in it. In volume one, Ten had already turned Riku down, assuming that he wasn't particularly sincere in his affections, but also because she really wasn't sure about her own feelings. Rei, therefore, is more of an added complication rather than a sole reason keeping a couple apart. The same could be said of the fact that Ten and Chiaki's plan to pretend to be dating in order to drive Rei off – while there were (and are) tentative crushes on both their parts, ultimately their playacting isn't the only, or even a major, factor in keeping Riku and Ten from becoming boyfriend and girlfriend. What's interesting about all of this is that Chiaki and Riku don't see it this way: in their minds, both things, especially the fiction of Ten dating Chiaki, are impediments that need to be worked around. In this way Shortcake Cake's third volume takes the path of letting us as readers see the bigger picture (Ten isn't sure who she likes or what she wants to do about it) as well as the self-centered (not in the sense of being selfish) views of both Riku and Chiaki, who see themselves as being much more important in Ten's big picture than they perhaps are. It's a good trick because we do tend to see ourselves as central to everything we experience, whether or not that's true in the minds of other people. In reality, Ten's thinking more about other things than she is of the two boys, but since they're both wrapped up in thoughts of her (and to a degree each other as rivals), they can't imagine that she's not on the same wavelength. While I'd hesitate to call it more realistic than other stories in the genre, it absolutely does bring something different to the table that helps it to stand out. None of this is to say that Ten isn't thinking about Riku and Chiaki at all, of course. Since she lives with them both at the boarding house, they're a large part of her daily life, and not always a comfortable part at that. Chiaki's opinion that she belongs with Riku isn't one that he keeps to himself, and his assertion that the other boy still likes Ten does make her rethink her interactions with him. She's still fairly convinced, however, that that ship has sailed, so she's more confused than anything by Chiaki's words and some of Riku's actions. Meanwhile the housemother of the boarding house has absolutely noticed the low-key romantic tension going on, and after a talk with Ten, she thinks to herself that while Riku may be the currently more attractive option, contrary to Chiaki's opinion, the bookish boy is the one who's probably a better fit for Ten. It isn't the traditional bad boy versus good boy situation that we often see, however, but more a question of how they make Ten feel around them, again playing with the typical romance narrative in that both are objectively nice guys. The decision very much rests with her. That she's not sure what, if anything, she wants to do is another touch of realism in the volume. She has had a crush before (and possibly a boyfriend; that's not entirely clear), so she's not a total innocent as many similar heroines would be, nor is she outwardly looking for love. This means that the stakes are rather higher for Riku (and maybe Chiaki) than they are for Ten herself. That doesn't necessarily indicate that she's going to be thinking more clearly than someone with more emotional irons in the fire, and it could make her into a prize to be won depending on how the plot continues to unfold. At this point, however, it means that she's not nearly as invested in the outcome as the two boys, and that could ultimately give her more power over the story's outcome in the long run. 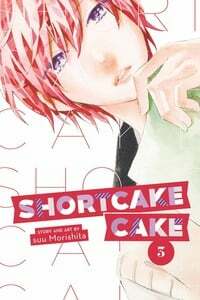 By this third volume, Shortcake Cake has shown itself to be an enjoyable combination of conventional shoujo romance and something less so. Ten continues to be a heroine worth following as she considers her feelings and whether or not Riku truly still likes her and what, if anything, that means. She's flattered, but she's also not someone who rushes into things, as we have seen from the outset when she took her time deciding to live in town instead of at home. Whatever decision she makes, watching her get to that point may be more interesting than which boy she ultimately ends up with.